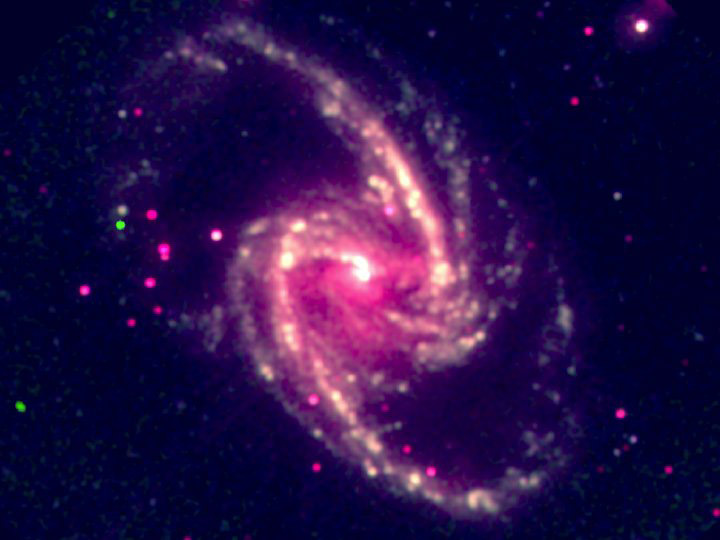 A composite X-ray image of the galaxy NGC1365 taken by NuSTAR and XMM-Newton. The best evidence yet that some supermassive black holes (SMBH) rotate at extremely high rates has been found by an international team of astronomers. Made using the recently launched NuStar space telescope, the study suggests that a huge black hole at the centre of a distant galaxy acquired a huge amount of rotational energy as it formed. The discovery could provide important information about how SMBHs and their associated galaxies form and evolve. Astronomers know that black holes that are as large as a billion solar masses can be found at the heart of most galaxies. Because these gravitational behemoths are created at the same time as their host galaxies, understanding how they formed could provide important information about galaxy formation and evolution. Knowing the spin of an SMBH can provide important clues about how it formed. If the black hole grew slowly, by sucking in small amounts of matter from all directions, then it isn’t expected to have much spin. However, if the formation process involves the black hole gorging rapidly on matter from a specific direction, conservation of angular momentum would leave it with an extremely large spin. Read more: Black hole found spinning near the relativistic limit – physicsworld.com.